The low-affinity sodium glucose cotransporter (SGLT2), which is expressed specifically in the kidney, plays a major role in renal glucose reabsorption in the proximal tubule. We have discovered sergliflozin, a prodrug of a novel selective SGLT2 inhibitor, based on benzylphenol glucoside. In structure, it belongs to a new category of SGLT2 inhibitors and its skeleton differs from that of phlorizin, a nonselective SGLT inhibitor. We investigated its pharmacological properties and potencies in vitro and in vivo. By examining a Chinese hamster ovary-K1 cell line stably expressing either human SGLT2 or human high-affinity sodium glucose cotransporter (SGLT1), we found sergliflozin-A (active form) to be a highly selective and potent inhibitor of human SGLT2. At pharmacological doses, sergliflozin, sergliflozin-A, and its aglycon had no effects on facilitative glucose transporter 1 activity, which was inhibited by phloretin (the aglycon of phlorizin). The transport maximum for glucose in the kidney was reduced by sergliflozin-A in normal rats. As a result of this effect, orally administered sergliflozin increased urinary glucose excretion in mice, rats, and dogs in a dose-dependent manner. 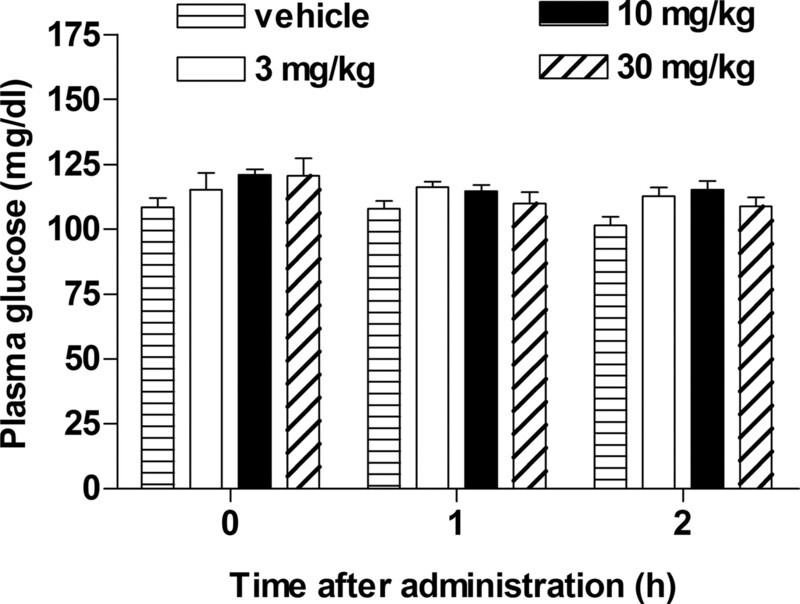 In an oral glucose tolerance test in diabetic rats, sergliflozin exhibited glucose-lowering effects independently of insulin secretion. Any glucose excretion induced by sergliflozin did not affect normoglycemia or electrolyte balance. These data indicate that selective inhibition of SGLT2 increases urinary glucose excretion by inhibiting renal glucose reabsorption. As a representative of a new category of antidiabetic drugs, sergliflozin may provide a new and unique approach to the treatment of diabetes mellitus. The kidney is important for the body's energy control. Glucose filtered from the blood in the glomerulus is reabsorbed mainly in the S1 segment of the kidney's proximal tubule (Bishop et al., 1979), but when the capacity for glucose reabsorption reaches saturation, excess glucose is excreted in the urine (Silverman and Turner, 1992). Two types of sodium glucose cotransporters mediate this reabsorption. The low-affinity sodium glucose cotransporter (SGLT2) is found almost exclusively in the kidney (Kanai et al., 1994), and several mutations in the human SGLT2 gene can cause renal glucosuria (van den Heuvel et al., 2002; Calado et al., 2004). Although the high-affinity sodium glucose cotransporter (SGLT1) is expressed to some extent in the kidney and contributes to glucose reabsorption, it is mainly expressed in the small intestine, where it is important in glucose absorption (Pajor and Wright, 1992; Wright, 2001). Genetic mutations in the SGLT1 gene leading to a functional defect are responsible for glucose/galactose malabsorption (Turk et al., 1991; Martin et al., 1996). The SGLT2 molecule was cloned as a candidate sodium glucose cotransporter, and its tissue distribution, substrate specificity, and affinities are reportedly very similar to those of the low-affinity sodium glucose cotransporter in the renal proximal tubule (Wells et al., 1992; Kanai et al., 1994). However, Kanai and co-workers felt that there was insufficient evidence to identify SGLT2 as the authentic protein for the low-affinity sodium glucose cotransporter since a high capacity for glucose transport was not observed for SGLT2 in Xenopus oocytes or mammalian cells (Wells et al., 1992; Kanai et al., 1994). Although several reports concerning genetic mutations in human SGLT2 suggest that this molecule plays some role in glucosuria, pharmacological validation in intact animals is needed to support SGLT2 playing a critical role in renal glucose reabsorption. Historically, phlorizin has been used in pharmacological analysis to elucidate the roles of SGLT (Ehrenkranz et al., 2005). However, several of its properties are disadvantageous for this purpose. Phlorizin is a nonselective SGLT inhibitor and is thus not suitable for distinguishing between SGLT1 and SGLT2 (Oku et al., 1999). Phloretin, the aglycon of phlorizin, is produced as a metabolite and may inhibit facilitative glucose transporter (GLUT1), which is responsible for glucose uptake in various tissues (Wheeler and Hinkle, 1981; Ehrenkranz et al., 2005). Several researchers have focused on the renal glucose reabsorption system as a way of improving hyperglycemia in type 2 diabetes mellitus, and SGLT inhibitors have been developed (Kees et al., 1996; Oku et al., 1999; Link and Sorensen, 2000; Ohsumi et al., 2003, Zhang et al., 2005, 2006). Several types of oral hypoglycemic drug are available for the clinical control of blood glucose (DeFronzo, 1999). Among these, sulfonylureas are insulin secretagogues with efficacies that depend on insulin secretion (Proks et al., 2002). Frequently, inappropriate, excessive insulin secretion is induced by sulfonylureas, and this causes hypoglycemia, a major clinical side effect (Melander, 2004). α-Glucosidase inhibitors are effective at preventing postprandial hyperglycemia by delaying carbohydrate digestion (Baron, 1998), and thus gastrointestinal symptoms such as soft feces or diarrhea are their main side effects (Vichayanrat et al., 2002). Thiazolidinediones promote adipocyte differentiation and enhance insulin sensitivity (Ferre, 2004), but body weight control may be compromised because glucose is accumulated as fat (Nesto et al., 2004). Biguanides exerts hypoglycemic effects by acting on energy production (Leverve et al., 2003). A novel drug is required that meets the patient's needs for both blood glucose control and body weight control, while preserving insulin secretion. In our strategy, SGLT2 was selected as a molecular target for the development of such a new antidiabetic drug for the following reasons. SGLT2 is exclusive expressed in renal proximal tubules, and thus a selective SGLT2 inhibitor ought not to affect other tissues. Enhancement of urinary glucose excretion via SGLT2 inhibition leads to a negative energy balance, which is not really achieved by any existing clinical pharmacological inventions (UK Prospective Diabetes Study Group, 1998). Phlorizin lowers blood glucose without increasing insulin secretion (Rossetti et al., 1987), and thus a SGLT2 inhibitor might also improve hyperglycemia without hypoglycemia being caused by excessive insulin secretion. Thus, we have attempted to obtain compounds without unwanted properties of phlorizin (selectivity, bioavailability, and GLUT1-inhibitory effect of its aglycon). In this study, to elucidate the role of SGLT2 in renal glucose reabsorption, we investigated the potency and properties of sergliflozin as a selective SGLT2 inhibitor in vitro and in vivo, and we also evaluated the potency and properties of sergliflozin as an antidiabetic drug. Chemicals. Sergliflozin [2-[(4-methoxyphenyl)methyl]phenyl 6-O-ethoxycarbonyl-β-d-glucopyranoside], sergliflozin-A [2-[(4-methoxyphenyl)methyl]phenyl β-d-glucopyranoside], and the aglycon of sergliflozin [2-[(4-methoxyphenyl)methyl]benzen-1-ol] were synthesized by Kissei Pharmaceutical Co. Ltd. (Azumino, Japan). Methyl-α-d-glucopyranoside (AMG), furosemide, and phlorizin dihydrate were purchased from Sigma-Aldrich (St. Louis, MO), methyl-α-d-[U14C]glucopyranoside and d-[6-3H]glucose were from Amersham Pharmacia Biotech (Little Chalfont, Buckinghamshire, UK), and phloretin was purchased from Wako Pure Chemicals (Osaka, Japan). Inhibitory Effects on Human SGLT1 and SGLT2 Activities. Human SGLT1 and SGLT2 genes were amplified by reverse transcription-polymerase chain reaction from the total RNA of small intestine and kidney (OriGene Technologies, Rockville, MD), respectively. The 2.0-kb cDNA of human SGLT1 (location 1–2005 in accession no. M24847) or the 2.0-kb cDNA of human SGLT2 (location 3–2039 in accession no. M95549) was ligated into pcDNA3.1(–) (Invitrogen, Carlsbad, CA) at XhoI/HindIII. Each plasmid was transfected into Chinese hamster ovary-K1 cells using Lipofectin (Invitrogen). Neomycin-resistant cell lines were selected using 1 mg/ml Geneticin (G-418) (Invitrogen). After selection of neomycin-resistant cells exhibiting sufficient SGLT activity, stable cell lines for SGLT1 (CS1-5–11D) and SGLT2 (CS2-5E) were established. CS1-5–11D and CS2-5E were maintained in Ham's F-12 medium containing 10% fetal calf serum and 200 μg/ml Geneticin in a humidified 5% CO2, 95% air environment at 37°C. For the uptake assay, cells were seeded into a 96-well culture plate at a density of 3 × 104 cells/well in Ham's F-12 medium containing 10% fetal calf serum. The cells were used 2 days after plating. They were incubated in pretreatment buffer (10 mM HEPES, 5 mM Tris, 140 mM choline chloride, 2 mM KCl, 1 mM CaCl2, and 1 mM MgCl2, pH 7.4) at 37°C for 10 min. They were then incubated in uptake buffer (10 mM HEPES, 5 mM Tris, 140 mM NaCl, 2 mM KCl, 1 mM CaCl2, and 1 mM MgCl2, pH 7.4) containing 14C-labeled (4 μM) and 14C-nonlabeled (1 mM) AMG at 37°C for 1 h. For the calculation of Ki values, the AMG concentrations used were 0.1 and 0.5 mM in uptake buffer. Uptake in the absence of Na+ was measured by substituting NaCl with choline chloride. Cells were washed twice with washing buffer (pretreatment buffer containing 10 mM AMG at room temperature) and then solubilized in 200 mM NaOH. The radioactivity was measured using a liquid scintillation counter. For the standard curve, the radioactivity in a series of diluents of AMG uptake buffer was measured. The amount of AMG uptake in 1 h in each well was obtained from the standard curve using Microsoft Excel 97 SR-2 (Microsoft, Redmond, WA), and the rate of uptake was calculated. Ki values were calculated from a Dixon plot of these data. In applying linear regression analysis, such data were used only if the correlation coefficients (r2) from the two straight lines were each >0.95. Animals. Male Sprague-Dawley (SD) rats were purchased from Japan SLC, Inc. (Hamamatsu, Japan), and female C57BL/6J mice from CLEA JAPAN Inc. (Tokyo, Japan). Throughout the study, these rodents were allowed a laboratory chow diet (CE-2 pellets; CLEA Japan, Inc.) and water ad libitum unless otherwise stated. Male Beagle strain dogs were purchased from Nosan Corporation (Yokohama, Japan). Throughout the study, the dogs were housed in individual cages and allowed daily about 200 g/body of a laboratory chow diet (CD-5 pellet; CLEA Japan, Inc.) and water ad libitum unless otherwise stated. The animal room was maintained under controlled conditions (20–25°C, 40–65% humidity, and a 12-h light/day photo-period with lights on at 8:00 AM). All animal studies were performed in accordance with guidelines approved by the Laboratory Animal Committee of Kissei Pharmaceutical Co., Ltd.
Transport Maximum for Glucose. The rats were used at the age of 8 weeks. Under light ether anesthesia, ureters were exposed through a low midline incision. Polyethylene catheters (PE10; Becton Dickinson, Sparks, MD) were introduced into the ureters to collect urine, and they were tied firmly into position. The skin incision was closed. A feeding tube (French 3.5; Terumo, Tokyo, Japan) was introduced into the right atrium of the heart through the right jugular vein to collect blood. Then, a polyethylene catheter (PE50; Becton Dickinson) was introduced into the distal part of the femoral vein, and used for glucose and sergliflozin-A infusions. Upon completion of the surgical procedures, 15 ml/kg saline was injected subcutaneously, and the animal was placed in a Ballman's cage. For 1 h until recovery from anesthesia, each animal was infused with saline through both femoral veins (through the right femoral vein at a rate of 5 ml/kg/h until the initiation of sergliflozin-A infusion; through the left femoral vein at a rate of 10 ml/kg/h until the initiation of glucose infusion). After recovery from anesthesia, sergliflozin-A in saline was infused at a rate of 5 ml/kg/h for 40 min. Once the plasma level of sergliflozin-A had reached the desired concentration, a one-half concentration of sergliflozin-A solution was infused to maintain the plasma concentration. Starting 75 min after the initiation of the sergliflozin-A infusion, 10, 20, and 30% glucose solutions were infused, each at a rate of 10 ml/kg/h for 30 min to raise plasma glucose gradually. Urine was collected for 15 min just before glucose infusion. Then, urine was collected for each 15-min interval, and urine volume was measured. Blood was obtained in the middle of each urine-sampling period (i.e., at 15-min intervals). Each time, about 0.35 ml of blood was collected in a heparinized tube, and a plasma sample was obtained by centrifugation (2000g; 10 min; 4°C). Urine and plasma samples were stored at –30°C until use. Creatinine and glucose were measured in each sample to calculate the following parameters: 1) glomerular filtration rate (milliliters per minute) = (urine creatinine; milligrams per deciliter) × (urine excretion rate; milliliters per minute)/(plasma creatinine; milligrams per deciliter); 2) glucose filtration rate (GF rate; milligrams per minute) = (plasma glucose; milligrams per milliliter) × glomerular filtration rate (milliliters per minute); 3) glucose excretion rate (GE rate; milligrams per minute) = (urine glucose; milligrams per milliliter) × (urine excretion rate; milliliters per minute); 4) glucose reabsorption rate (GR rate; milligrams per minute) = GF rate (milligrams per minute) – GE rate (milligrams per minute); and 5) TmG = mean of the maximal GR rate values. Plasma glucose and urine glucose were measured using DRI-CHEM 3500V (Fuji Photo Film, Tokyo, Japan). Plasma creatinine was measured using a Hitachi AutoAnalyzer 7150 (Hitachi, Tokyo, Japan). Urine creatinine was measured using a Creatinine-test Wako (Wako Pure Chemicals). Urinary Glucose Excretion in Mice. Sergliflozin was suspended (5 ml/kg) in 0.5% sodium carboxymethylcellulose (CMC) and administered orally to female C57BL/6J mice (9 weeks of age) after 4-h fasting. Urine was collected while the animals were in the metabolic cages. After measuring urine volume, an aliquot of each urine sample was stored at –20°C until use. The glucose concentration in urine was measured using a diagnostic kit, Glucose B-test Wako (Wako Pure Chemicals). Urinary Glucose Excretion in Rats. Sergliflozin suspension (5 ml/kg, in 0.5% CMC) was administered orally to male SD rats (7 weeks of age). Urinary glucose was determined as described above. Urinary Glucose Excretion in Dogs. Sergliflozin was mixed with cellulose powder in a mortar at the ratio of 1:4 (sergliflozin/cellulose, w/w). The mixtures were equally divided and encapsulated in two or three hard gelatin capsules. The capsules were orally administered to beagle dogs at the age of 8 to 10 months at 9:00 AM to 10:00 AM (before feeding). The animals were fed a laboratory chow diet (200 g/body) at 4 h after administration of the test compound. Urinary glucose was determined as described above. Glucose-Lowering Effect in Oral Glucose Tolerance Test. Male SD rats (5 weeks of age) were made mildly diabetic by a single tail injection of streptozotocin (35 mg/kg), and the glucose-lowering effect of sergliflozin was investigated 14 or 15 days later. An oral glucose tolerance test (2 g of glucose/5 ml/kg) was performed after an overnight (16 h) fast. Sergliflozin suspension (5 ml/kg, in 0.5% CMC) and glucose were sequentially administered orally. Blood was collected in heparinized tubes from the tail artery at each sampling point. Plasma samples were obtained by centrifugation (2000g; 10 min; 4°C) and stored at –20°C until use. The glucose concentration in the plasma was measured using a Glucose B-test Wako diagnostic kit (see above). Plasma insulin was measured using a commercial enzyme-linked immunosorbent assay kit (Morinaga Institute of Biological Science, Inc., Yokohama, Japan). Evaluation of Hypoglycemic Risk. Male SD rats (7 weeks of age) were fasted for 6 h. Sergliflozin suspension was then administered orally (5 ml/kg, in 0.5% CMC). Blood sampling and measurement of plasma glucose were performed as described above. Urine Volume and Urinary Electrolytes. Male SD rats (7 weeks of age) were housed individually in a metabolic cage to acclimate for 8 days before the experiment. Sergliflozin was suspended in 0.5% CMC, whereas furosemide was suspended in 5% (w/v) gum arabic. Drug suspension (5 ml/kg) and saline (25 ml/kg) were sequentially administered to the rats, and urine was collected while the animals were in the metabolic cages. To evaluate the time course of any effects, several periods for urine collection were set as follows: 0 to 2, 2 to 4, 4 to 6, 6 to 8, and 8 to 24 h. Urinary electrolytes were measured using electrolyte analyzer SERA-720 (Horiba, Tokyo, Japan) and chloride counter CL-6 (Hiranuma, Mito, Japan). Statistical Analysis. Data are presented as means ± S.E.M. Calculations were performed using Microsoft Excel 97 SR-2 and statistical analysis were performed using SAS Systems, version 8.2 (SAS Institute, Cary, NC). In this analysis, data were analyzed among three or more groups as follows. When equality of variances was indicated by a Bartlett's test, statistical analysis was performed using a one-way analysis of variance followed by a Dunnett's multiple comparison test. When equality of variances was not indicated by a Bartlett's test, statistical analysis was performed using a Kruskal-Wallis test followed by a Dunnett's multiple comparison test. Comparisons between two groups were made as follows. When equality of variances was indicated by an F-test, statistical analysis was performed using a Student's t test. When equality of variances was not indicated by an F-test, statistical analysis was performed using a Welch's t test. Structure of Sergliflozin. The structures of sergliflozin, sergliflozin-A, and the aglycon of sergliflozin are shown in Fig. 1. Sergliflozin was obtained as a prodrug of sergliflozin-A (the active form), the structural scaffold of which is based on benzylphenol glucoside, and it differs from the phlorizin skeleton. Chemical structures of sergliflozin (A), active form of sergliflozin (sergliflozin-A) (B), the aglycon of sergliflozin (C), and phlorizin (D). Sergliflozin is a prodrug designed to be converted to sergliflozin-A within the body. Inhibition Potency and Selectivity for Human SGLT2. The Ki values for sergliflozin, sergliflozin-A, and phlorizin toward human SGLTs are shown in Table 1. The rank order of potency for inhibiting SGLT2 was sergliflozin-A > phlorizin > sergliflozin, whereas for inhibiting SGLT1 it was phlorizin > sergliflozin-A > sergliflozin. The ratio of selectivity (Ki toward SGLT1/Ki toward SGLT2) was 296-fold for sergliflozin-A. Compared with phlorizin, sergliflozin-A was approximately 7 times more active against SGLT2, but it was only one-fifth as active against SGLT1. A Dixon-plot analysis for sergliflozin-A displayed good linearity toward both human SGLT1 and toward SGLT2 (Fig. 2, A and B). 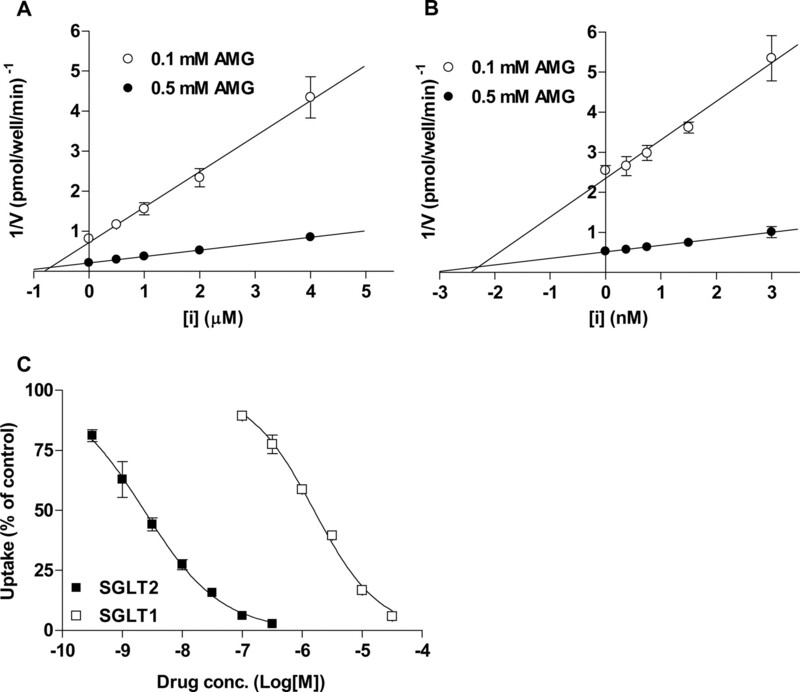 Dose-dependent inhibition of AMG uptake was observed with sergliflozin-A in both CS1–5-11D (human SGLT1) and CS2–5E (human SGLT2) cells (Fig. 2C). These data suggest that sergliflozin-A, the active form of sergliflozin, is a potent and selective SGLT2 inhibitor. Data are presented as means ± S.E.M. (number of experiments). Inhibitory effects of sergliflozin-A on human SGLT1 and human SGLT2. 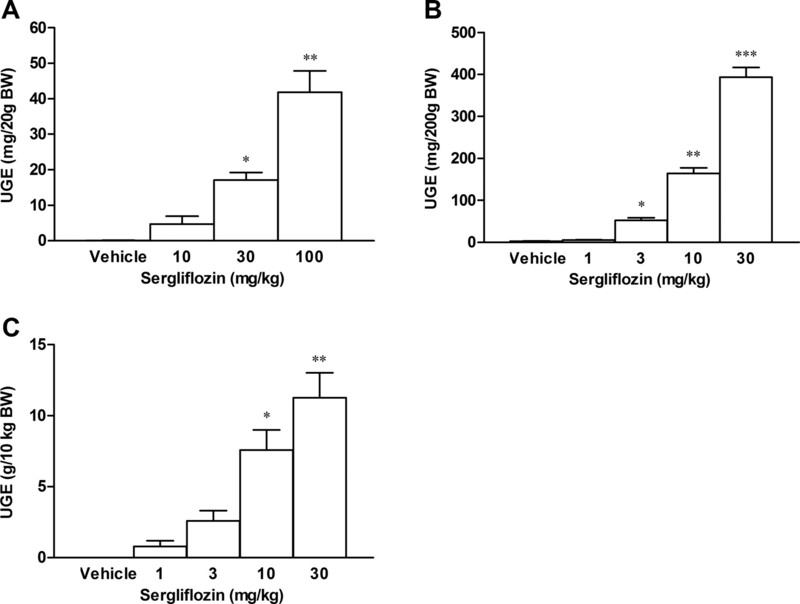 Dixon plots of effects of sergliflozin-A on human SGLT1 (A) and human SGLT2 (B). Dose-response curves for inhibitory effects of sergliflozin-A on human SGLT1 and human SGLT2 (C). For Dixon plots, AMG uptake at 0.1 or 0.5 mM was measured in the presence of various concentrations of sergliflozin-A. For dose-response curves, AMG uptake was measured at 1.0 mM AMG. Data are presented as means ± S.E.M. from three to five experiments. Glucose Uptake Assay in Erythrocytes. The effects (percentage of inhibition) of sergliflozin, sergliflozin-A, the aglycon of sergliflozin, phlorizin, and phloretin toward human GLUT1 are summarized in Table 2. No significant differences were observed among sergliflozin-A, sergliflozin, the aglycon of sergliflozin, and phlorizin. Phloretin inhibited human GLUT1 activity in a dose-dependent manner, and significant differences from control were observed at 10 and 100 μM. These data suggest that at pharmacological concentrations, sergliflozin and related compounds have no effect on GLUT1 activity. Data are presented as means ± S.E.M. of percentage of inhibition from four samples. Effects on TmG in Rats. The general relationship of GR rate, GE rate, GF rate, and TmG is shown in Fig. 3A. Figure 3 also shows typical patterns for these parameters in a glucose-infused control rat (Fig. 3B) and in a rat with sergliflozin-A at a plasma concentration of 404 ng/ml (Fig. 3C). In the rat treated with sergliflozin-A, GR rate became saturated at a lower concentration of plasma glucose than in the glucose-infused control rat, indicating that TmG was reduced by sergliflozin. The summary data shown in Fig. 3D indicate a dose-dependent reduction of TmG by sergliflozin-A (Fig. 3D). 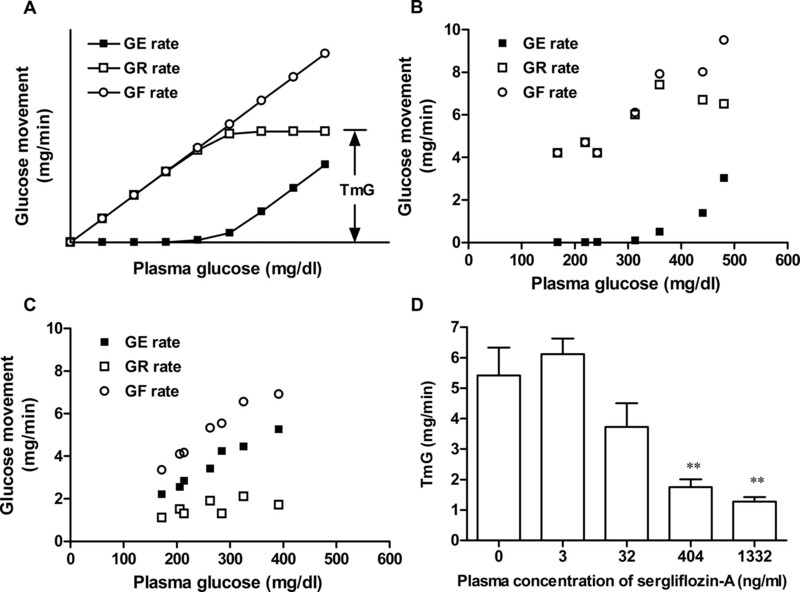 The above-mentioned data demonstrate that sergliflozin-A suppresses glucose reabsorption by inhibiting SGLT2 and that it lowers the threshold value for glucosuria in intact rats. Effects of sergliflozin-A on TmG in normal rats. General relationship of GR rate, GE rate, GF rate, and TmG (A). Typical patterns for these parameters in a control rat (B) and in a rat treated with sergliflozin-A (404 ng/ml in plasma) (C). 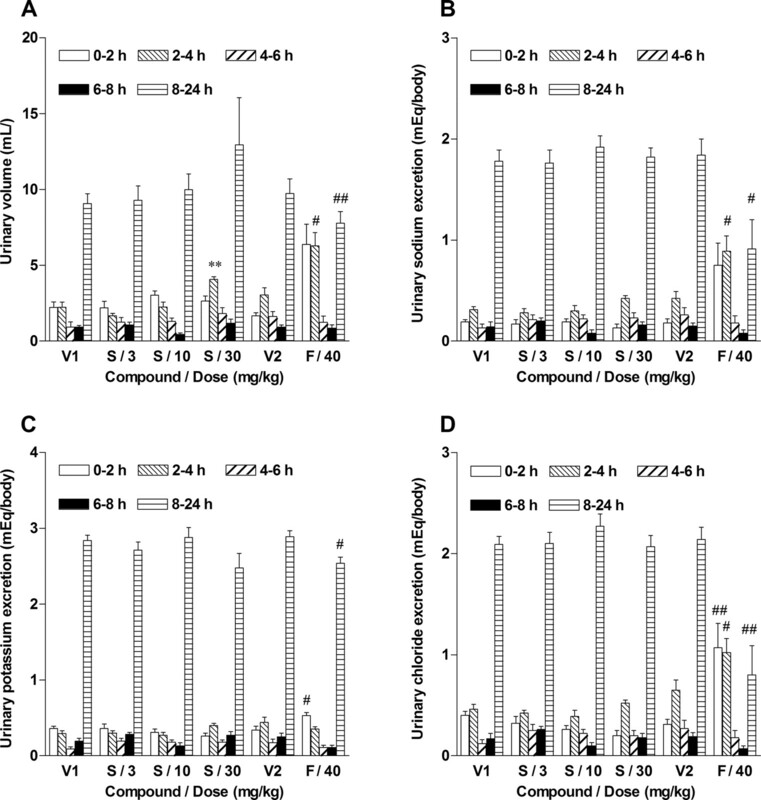 Dose-dependent reduction in TmG in rats treated with sergliflozin-A (means ± S.E.M. from four animals) (D). **, p < 0.01 versus vehicle group (in which plasma concentration was 0). Effects on Urinary Glucose Excretion in Mice, Rats, and Dogs. In normal mice, urinary glucose excretion was increased by the oral administration of sergliflozin in a dose-dependent manner (Fig. 4A). Likewise, this drug dose dependently induced glucosuria in both rats and dogs (Fig. 4, B and C). Dose-dependent effect was observed in each of these three species. On the basis of these results, sergliflozin has considerable potential as an inducer of urinary glucose excretion, and it is a suitable candidate for validation as a selective SGLT2 inhibitor by oral administration. Glucose-Lowering Effects in Diabetic Rats in Oral Glucose Tolerance Test. Following a result of injection of 35 mg/kg streptozotocin, rats presented with mild postprandial hyperglycemia (Fig. 5A, vehicle group). In this model, sergliflozin significantly inhibited the increase in plasma glucose in a dose-dependent manner (Fig. 5A). At the same time, the plasma insulin level showed reductions corresponding to those induced by sergliflozin in the plasma glucose level (Fig. 5B). Thus, sergliflozin reduces the plasma glucose level without stimulating insulin secretion. Sergliflozin Has Little Effect on Normoglycemia in 6-h Fasting Rats. Sergliflozin did not significantly alter the normal glucose level in 6-h fasted rats (Fig. 6). These data suggest that sergliflozin has no effects on normoglycemia, and the risk of hypoglycemia with this drug is predicted to be low. Effects on Urine Volume and Urinary Electrolytes. Although a slight, temporary diuretic effect was observed at the highest dose (30 mg/kg) of sergliflozin, no significant changes in urine volume were observed at either 3 or 10 mg/kg (Fig. 7A). Excretion of urinary electrolytes (sodium, potassium, and chloride) was not significantly affected by sergliflozin (Fig. 7, B–D). We focused on SGLT2 as a molecular target for this investigation because it plays a major role in renal glucose reabsorption, and its tissue distribution is limited in the kidney to reduce the likelihood for mechanism-based side effects. By means of a screening system using recombinant human SGLT1 or SGLT2, we obtained both sergliflozin (prodrug) and sergliflozin-A (active form). On the basis of the calculated Ki values and the dose-response curves, we confirmed that sergliflozin-A is a highly potent and selective SGLT2 inhibitor (Table 1; Fig. 2). Although several human SGLT inhibitors have been reported to date, detailed analysis of their selectivity for human SGLT2 or pharmacological evaluation has been limited (Oku et al., 1999; Link and Sorensen, 2000; Ohsumi et al., 2003; Zhang et al., 2005, 2006). According to Oku et al. (1999), the selectivity ratio of T-1095A is approximately 4 (Oku et al., 1999). In our assay, sergliflozin-A exhibited high selectivity for SGLT2 with a 296-fold ratio of Ki values (SGLT1/SGLT2). These results indicate that sergliflozin can be referred to as a novel, selective SGLT2 inhibitor. Oral administration of sergliflozin increased urinary glucose excretion in mice (A), rats (B), and dogs (C). Data are presented as means ± S.E.M. from four mice (A), eight rats (B), or three dogs (C). *, p < 0.05; **, p < 0.01; and ***, p < 0.001 versus vehicle group. Effects of sergliflozin on postprandial hyperglycemia (A) and insulin secretion (B) in oral glucose tolerance test in diabetic rats. Male SD rats (7 weeks of age) were made mildly diabetic by injection of streptozotocin. Following the oral administration of sergliflozin or vehicle, glucose (2 g/kg) was administered orally to the diabetic rats after 16-h fasting. Data are presented as means ± S.E.M. from eight animals. *, p < 0.05; **, p < 0.01; and ***, p < 0.001 versus vehicle group. Phlorizin is easily hydrolyzed to phloretin and glucose by intestinal glycosidase, and this cleavage causes poor oral efficacy of phlorizin. Phloretin has the potency to be considered a strong inhibitor of GLUT1, which is present at high levels in primate erythrocytes and brain endothelial cells (where it serves to supply glucose as the energy source) (Seidner et al., 1998). The GLUT1 inhibitory activity of phloretin is one reason for the usefulness of phlorizin as a diabetic medicine. We selected a basal scaffold structure different from that of phlorizin as the starting point of our attempt to develop an SGLT2 inhibitor without the above-mentioned properties. Indeed, sergliflozin, sergliflozin-A, and the aglycon of sergliflozin had no effects on GLUT1 activity at pharmacological concentrations, and oral administration of sergliflozin should be useful for pharmacological or medical treatment without the unwanted side effects caused by inhibition of GLUT1. Effects of sergliflozin on plasma glucose level in 6-h fasted normal rats. Male SD rats (7 weeks of age) were fasted for 6 h, laboratory diets being removed at 8:30 AM, and oral glucose tolerance test was performed at 2:30 PM. Sergliflozin was administered orally to the rats. Data are presented as means ± S.E.M. from four animals. Effects of sergliflozin or furosemide on urinary volume (A) and electrolytes [sodium (B), potassium (C), and chloride (D)] in rats. Sergliflozin or furosemide was administered orally to the rats. Then, 25 ml of saline was administered. V1, vehicle 1 was 0.5% CMC, used for formulating sergliflozin; S, sergliflozin; V2, vehicle 2 was 5% (w/w) gum arabic, used for formulating furosemide; and F, furosemide. No significant differences were observed between the V1 group and V2 groups. Data are presented as means ± S.E.M. from six or seven animals. **, p < 0.01 versus vehicle 1 group. #, p < 0.05 and ##, p < 0.01 versus vehicle 2 group. To assess whether administration of this selective SGLT2 inhibitor increases urinary glucose excretion, by suppressing renal glucose reabsorption, we investigated the effect of sergliflozin-A on TmG in the normal rat. Sergliflozin-A reduced TmG in a dose-dependent manner, and consequently it increased the urinary excretion of glucose. T-1095A has been evaluated in dogs from a similar standpoint, but it is a nonselective SGLT inhibitor, like phlorizin (Ueta et al., 2006). The present results with our selective SGLT2 inhibitor were similar to those obtained with this nonselective SGLT inhibitor, thus providing pharmacological validation for the notion that SGLT2 is the major player in renal glucose reabsorption. From the effects on urinary glucose excretion induced by oral administration in rodents and dogs, it was concluded that sergliflozin is a prodrug with properties that make it suitable for oral formulations. Sergliflozin induced glucose-lowering effects in our diabetic rats upon oral administration (Fig. 5A). Rapid- and short-acting insulin secretagogues or α-glucosidases have often been evaluated in mildly diabetic rats (i.e., rats with a degree of diabetes severity similar to that induced here (Ikenoue et al., 1997; Ichikawa et al., 2002). Sergliflozin provides a parallel to these antidiabetics as a way of improving postprandial hyperglycemia, at least in diabetic rats. The blood glucose-lowering effect of sergliflozin did not depend on an increase in insulin secretion (Fig. 5B). In clinical practice, patients taking oral hypoglycemics frequently encounter hypoglycemia due to inappropriate, excessive insulin secretion. Especially when using long-acting sulfonylureas, the optimum dose should be one that carries little risk of hypoglycemia while having sufficient therapeutic efficacy (Melander, 2004). In our study, even in a 6-h fasted condition, sergliflozin did not cause a hypoglycemia of below 70 mg/dl plasma glucose. Similar observations suggesting little effect on normoglycemia have been reported with T-1095 (Oku et al., 2000). The ability to induce a glucose-lowering effect without increasing insulin secretion is a property of the present selective SGLT2 inhibitor that represents a considerable advantage in a potential antidiabetic medicine for clinical use. Since sodium-ion transport accompanies the glucose transport promoted by SGLT2, we evaluated urinary electrolyte excretion. In a previous study, sodium excretion was unaffected by T-1095 in KK-Ay mice (Tsujihara et al., 1999). Similarly, sergliflozin had no almost effect on urinary electrolyte excretion, a temporary osmotic diuresis being observed only at the highest dose. These results suggest that this selective SGLT2 inhibitor produces its antidiabetic effect without inducing either a marked osmotic diuresis or an electrolyte imbalance at pharmacological doses. Type 2 diabetes mellitus has increased in incidence as lifestyles involving excessive calorie intake and lack of exercise have become more prevalent. The basic management of type 2 diabetes mellitus involves controlling the energy balance of the body by dietary means and by increasing exercise levels, and there is a lack of drugs that can be used to control energy balance in a negative direction. Thus, an antidiabetic drug that does this would represent a new approach to the treatment of type 2 diabetes mellitus. In this study, we demonstrated that sergliflozin is a highly selective SGLT2 inhibitor and that it increased urinary glucose excretion; consequently, it had glucose-lowering effects, without inducing either hypoglycemia or excessive insulin secretion. An increase in urinary glucose excretion leads to a negative energy balance. These properties of this SGLT2 inhibitor enable it to meet the suitable for blood glucose control with body weight control and preservation of insulin secretion. In this sense, SGLT2 inhibitors offers some advantages as antidiabetic drugs over existing antidiabetic drugs such as sulfonylureas, α-glucosidase inhibitors, thiazolidinediones, and biguanides. Our results with sergliflozin, a novel selective SGLT2 inhibitor developed by us, demonstrate that SGLT2 plays a major role in renal glucose reabsorption. We propose this SGLT2 inhibitor as a representative of a useful new category of drug for the treatment of diabetes mellitus. ABBREVIATIONS: SGLT1, high-affinity sodium glucose cotransporter; SGLT2, low-affinity sodium glucose cotransporter; GLUT1, facilitative glucose transporter 1; AMG, methyl-α-d-glucopyranoside; kb, kilobase(s); D-PBS, Dulbecco's phosphate-buffered saline; SD, Sprague-Dawley; TmG, transport maximum for glucose; GF, glucose filtration; GE, glucose excretion; GR, glucose reabsorption; CMC, sodium carboxymethylcellulose. Bishop JH, Green R, and Thomas S (1979) Free-flow reabsorption of glucose, sodium, osmoles and water in rat proximal convoluted tubule. J Physiol (Lond) 288: 331–351. Baron AD (1998) Postprandial hyperglycaemia and alpha-glucosidase inhibitors. Diabetes Res Clin Pract 40 (Suppl): S51–S55. Calado J, Soto K, Clemente C, Correia P, and Rueff J (2004) Novel compound heterozygous mutations in SLC5A2 are responsible for autosomal recessive renal glucosuria. Hum Genet 114: 314–316. DeFronzo RA (1999) Pharmacologic therapy for type 2 diabetes mellitus. Ann Intern Med 131: 281–303. Ehrenkranz JR, Lewis NG, Kahn CR, and Roth J (2005) Phlorizin: a review. Diabetes Metab Res Rev 21: 31–38. Ferre P (2004) The biology of peroxisome proliferator-activated receptors: relationship with lipid metabolism and insulin sensitivity. Diabetes 53 (Suppl): S43–S50. Ichikawa K, Yamato T, Ojima K, Tsuji A, Ishikawa K, Kusama H, and Kojima M (2002) Effect of KAD-1229, a novel hypoglycaemic agent, on plasma glucose levels after meal load in type 2 diabetic rats. Clin Exp Pharmacol Physiol 29: 423–427. Ikenoue T, Okazaki K, Fujitani S, Tsuchiya Y, Akiyoshi M, Maki T, and Kondo N (1997) Effect of a new hypoglycemic agent, A-4166 [(–)-N-(trans-4-isopropylcyclohexanecarbonyl)-D-phenylalanine], on postprandial blood glucose excursion: comparison with voglibose and glibenclamide. Biol Pharm Bull 20: 354–359. Kanai Y, Lee WS, You G, Brown D, and Hediger MA (1994) The human kidney low affinity Na+/glucose cotransporter SGLT2: delineation of the major renal reabsorptive mechanism for d-glucose. J Clin Investig 93: 397–404. Kees KL, Fitzgerald JJ Jr, Steiner KE, Mattes JF, Mihan B, Tosi T, Mondoro D, and McCaleb ML (1996) New potent antihyperglycemic agents in db/db mice: synthesis and structure-activity relationship studies of (4-substituted benzyl) (trifluoromethyl)pyrazoles and -pyrazolones. J Med Chem 27: 3920–3928. Leverve XM, Guigas B, Detaille D, Batandier C, Koceir EA, Chauvin C, Fontaine E, and Wiernsperger NF (2003) Mitochondrial metabolism and type-2 diabetes: a specific target of metformin. Diabetes Metab 29: 6S88–94. Link JT and Sorensen BK (2000) A method for preparing C-glycosides related to phlorizin. Tetrahedron Lett 41: 9212–9217. Martin MG, Turk E, Lostao MP, Kerner C, and Wright EM (1996) Defects in Na+/glucose cotransporter (SGLT1) trafficking and function cause glucose-galactose malabsorption. Nat Genet 12: 216–220. Melander A (2004) Kinetics-effect relations of insulin-releasing drugs in patients with type 2 diabetes: brief overview. Diabetes 53 (Suppl 3): S151–S155. Nesto RW, Bell D, Bonow RO, Fonseca V, Grundy SM, Horton ES, Le Winter M, Porte D, Semenkovich CF, Smith S, et al. (2004) Thiazolidinedione use, fluid retention, and congestive heart failure: a consensus statement from the American Heart Association and American Diabetes Association. Diabetes Care 27: 256–263. Oku A, Ueta K, Arakawa K, Ishihara T, Nawano M, Kuronuma Y, Matsumoto M, Saito A, Tsujihara K, Anai M, et al. (1999) T-1095, an inhibitor of renal Na+-glucose cotransporters, may provide a novel approach to treating diabetes. Diabetes 48: 1794–1800. Oku A, Ueta K, Nawano M, Arakawa K, Kano-Ishihara T, Matsumoto M, Saito A, Tsujihara K, Anai M, and Asano T (2000) Antidiabetic effect of T-1095, an inhibitor of Na+-glucose cotransporter, in neonatally streptozotocin-treated rats. Eur J Pharmacol 391: 183–192. Ohsumi K, Matsueda H, Hatanaka T, Hirama R, Umemura T, Oonuki A, Ishida N, Kageyama Y, Maezono K, and Kondo N (2003) Pyrazole-O-glucosides as novel Na+-glucose cotransporter (SGLT) inhibitors. Bioorg Med Chem Lett 13: 2269–2272. Pajor A and Wright EM (1992) Cloning and functional expression of a mammalian Na+/nucleoside cotransporter. A member of the SGLT family. J Biol Chem 267: 3557–3560. Proks P, Reimann F, Green N, Gribble F, and Ashcroft F (2002) Sulfonylurea stimulation of insulin secretion. Diabetes 51 (Suppl): S368–S376. Rossetti L, Smith D, Shulman GI, Papachristou D, and DeFronzo RA (1987) Correction of hyperglycemia with phlorizin normalizes tissue sensitivity to insulin in diabetic rats. J Clin Investig 79: 1510–1515. Seidner G, Alvarez MG, Yeh JI, O'Driscoll KR, Klepper J, Stump TS, Wang D, Spinner NB, Birnbaum MJ, and De Vivo DC (1998) GLUT-1 deficiency syndrome caused by haploinsufficiency of the blood-brain barrier hexose carrier. Nat Genet 18: 188–191. Silverman M and Turner RJ (1992) Glucose transport in the renal proximal tubule, in Handbook of Physiology. Section 8: Renal Physiology. Vol 2 (Windhager EE ed) pp 2017–2038, Oxford University Press, Oxford, UK. Tsujihara K, Hongu M, Saito K, Inamasu M, Arakawa K, Oku A, and Matsumoto M (1996) Na+-glucose cotransporter inhibitors as antidiabetics. 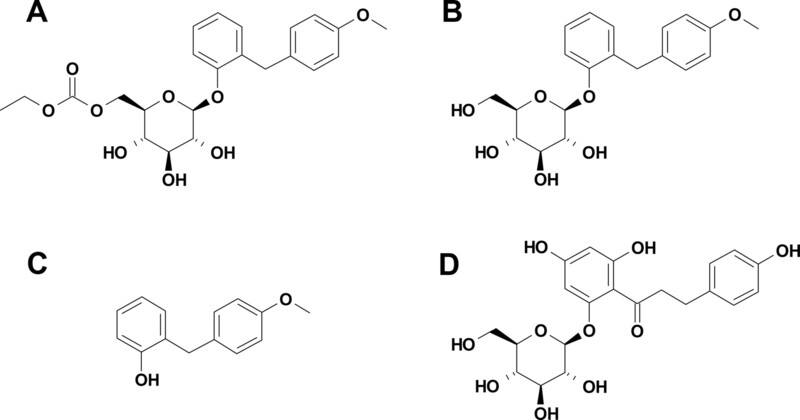 I. Synthesis and pharmacological properties of 4′-dehydroxyphlorizin derivatives based on a new concept. Chem Pharm Bull (Tokyo) 44: 1174–1180. Tsujihara K, Hongu M, Saito K, Kawanishi H, Kuriyama K, Matsumoto M, Oku A, Ueta K, Tsuda M, and Saito A (1999) Na+-glucose cotransporter (SGLT) inhibitors as antidiabetic agents. 4. Synthesis and pharmacological properties of 4′-dehydroxyphlorizin derivatives substituted on the B ring. J Med Chem 42: 5311–5324. Turk E, Zabel B, Mundlos S, Dyer J, and Wright EM (1991) Glucose/galactose malabsorption caused by a defect in the Na+/glucose cotransporter. Nature (Lond) 350: 354–356. Ueta K, Yoneda H, Oku A, Nishiyama S, Saito A, and Arakawa K (2006) Reduction of renal transport maximum for glucose by inhibition of Na+-glucose cotransporter suppresses blood glucose elevation in dogs. Biol Pharm Bull 29: 114–118. UK Prospective Diabetes Study Group (1998) Intensive blood-glucose control with sulphonylureas or insulin compared with conventional treatment and risk of complications in patients with type 2 diabetes (UKPDS 33). Lancet 352: 837–853. van den Heuvel LP, Assink K, Willemsen M, and Monnens L (2002) Autosomal recessive renal glucosuria attributable to a mutation in the sodium glucose co-transporter (SGLT2). Hum Genet 111: 544–547. Vichayanrat A, Ploybutr S, Tunlakit M, and Watanakejorn P (2002) Efficacy and safety of voglibose in comparison with acarbose in type 2 diabetic patients. Diabetes Res Clin Pract 55: 99–103. Wheeler TJ and Hinkle PC (1981) Kinetic properties of the reconstituted glucose transporter from human erythrocytes. J Biol Chem 256: 8907–8914. Wells RG, Pajor AM, Kanai Y, Turk E, Wright EM, and Hediger MA (1992) Cloning of a human kidney cDNA with similarity to the sodium-glucose cotransporter. Am J Physiol 263: F459–F465. Wright EM (2001) Renal Na+-glucose cotransporters. Am J Physiol 280: F10–F18. Zhang X, Urbanski M, Patel M, Zeck RE, Cox GG, Bian H, Conway BR, Pat Beavers M, Rybczynski PJ, and Demarest KT (2005) Heteroaryl-O-glucosides as novel sodium glucose co-transporter 2 inhibitors. Part 1. Bioorg Med Chem Lett 15: 5202–5206. Zhang X, Urbanski M, Patel M, Cox GG, Zeck RE, Bian H, Conway BR, Pat Beavers M, Rybczynski PJ, and Demarest KT (2006) Indole-glucosides as novel sodium glucose co-transporter 2 (SGLT2) inhibitors. Part 2. Bioorg Med Chem Lett 16: 1696–1701.